Yes, I do call this cold. I live in Florida and even though you are used to "real" cold back home, I am suffering when it's 60 degrees. Yes, I know that's ridiculous but I share that same flaw with millions of other Floridians. Hey, it's part of the price you pay to live in a tropical climate. To the former colleague who saw fit to steal and reuse photos from a listing I sold a year ago, shame on you for not calling me to ask permission. While it may be within the rules of the MLS to use photos from an old listing, it is bad form to use them without alerting the other agent first. I would have agreed had you asked but instead, I am forced to revisit my opinion of you. At least you stole my crummy cell phone shot of the building in addition to several that I paid a photographer to take. I suppose you knew the listing was unlikely to sell at that price so you opted to save the photographer's fee. Priced right it would have already sold, photo quality be damned, in the 106 days it's been active. If not for the strong performance in 2017 I'd be predicting a slow 2018 for the Cocoa Beach real estate market considering the still-declining inventory in our two cities. However, we somehow closed 664 units so far in 2017 with a beginning inventory of 198 units so it's reasonable to expect a similar magical result next year. Inventory of existing condos and townhomes in Cocoa Beach and Cape Canaveral is at 188 units this morning with 54 single family homes also offered. So far in 2017, in addition to 664 closed condo units, 155 single family homes have closed. For what it's worth, from my perch above downtown Cocoa Beach, activity feels subdued. The recent flow of under contract properties confirms that. I will do a full year-end wrap-up in early January. I hope everyone enjoys the holidays and has a fun, safe and rewarding time with those with whom they share the season. Thanks to everyone who emailed, called or visited me during the year. 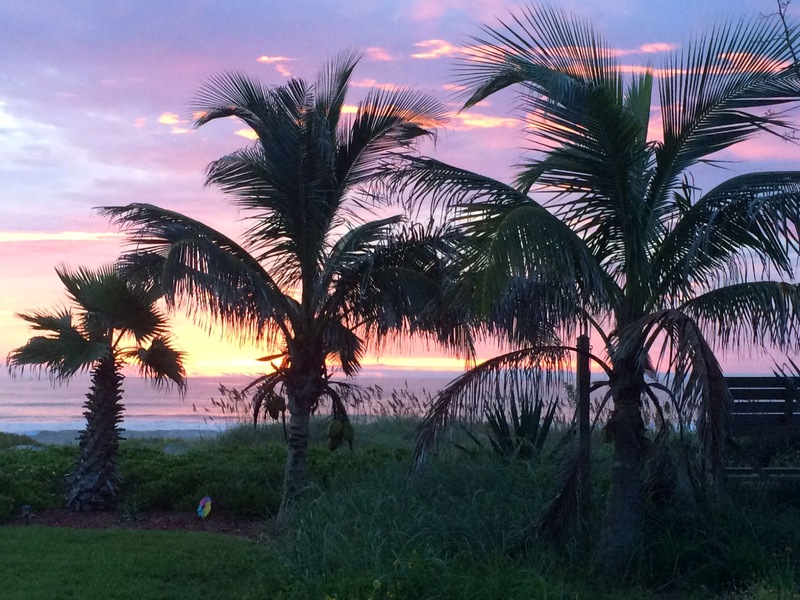 I enjoy hearing from readers of this blog and it helps to keep me motivated to continue reporting on the Cocoa Beach real estate scene. 2018 will be the thirteenth year that this blog has been in existence. When I began writing in 2005 very few people knew what a blog was and, other than Realtor.com, none of the top real estate sites of today were even in existence. Being a Cocoa Beach expert back then required actually being involved in the market, not simply writing a check to Zillow to display one's Glamour Shot with the other 500 Cocoa Beach "experts". Whatever. Progress. We're sure to see more next year. And fall and fall. My tongue-in-cheek comment in the previous post about growing rice on the Cocoa Beach Country Club golf course is looking less snide than realistic today. Cocoa Beach has received over a foot of rain since I wrote that post. My friends and I managed to squeeze in six holes yesterday before rain closed the course once again. 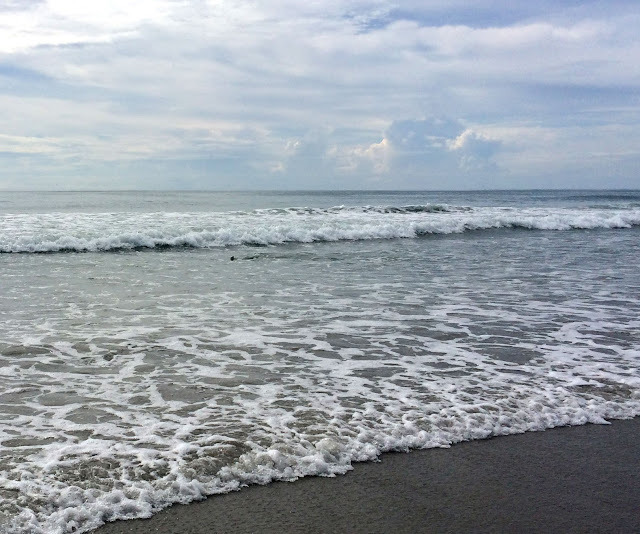 The average October rainfall in Cocoa Beach is 4.76 inches. We received 7.3 inches on the first day of the month and, so far, we're at 12.85 inches and counting with over 2 inches yesterday. The silver lining, if you can call it that, is that the Banana River has finally receded enough to accept limited runoff. Real estate activity has resumed at its typical fall pace since the hurricane with 49 condos and townhomes and nine single family homes contracted since the storm passed. Inventory remains very low with a high proportion of optimistically priced offerings. For instance, $413 per square foot for a 32 year old 2/2 oceanfront condo in mainly original condition or $309 a foot for a 44 year old 2/2 unit with a tiny oceanside balcony and Formica countertops. Neither of these unremarkable units has a garage. About price per square foot: It is not an exact metric for determining value but is a good starting point. If other 30 to 40 year old units without garages of approximately the same size and condition with a similar view are selling for $250 per square foot then my unit is very unlikely to command $400 or even $300 a foot no matter the depleted inventory. High demand and low supply contribute to rising prices but they rarely induce buyers to pay way above fair value. Finding an agent willing to take an overpriced listing, however, is easy. Agents will take unsaleable listings with the hope that the seller will eventually come to their senses but even without an eventual price drop the listing has value for the agent. Buyers who inquire about the overpriced listing can be shown other fairly priced offerings. An agent's willingness to accept a listing at an unjustified high price is not confirmation of the possibility of getting close to that number. The agent may just be seeing the listing's potential as a good lead-generator. I'm looking at you, side view Cape Canaveral condo in original condition without a garage asking the same outrageous $305 per square foot since last December. Drop the price by 20% and I'm guessing a buyer will materialize. It may not feel like it to most Floridans but we get missed far more often than we get hit, thank goodness. The 2017 storm season so far illustrated above. Three weeks post-Irma and we are gradually getting ourselves back together. The streets of Cocoa Beach and Cape Canaveral are still lined with piles of debris and blue tarps adorn many structures including my office. 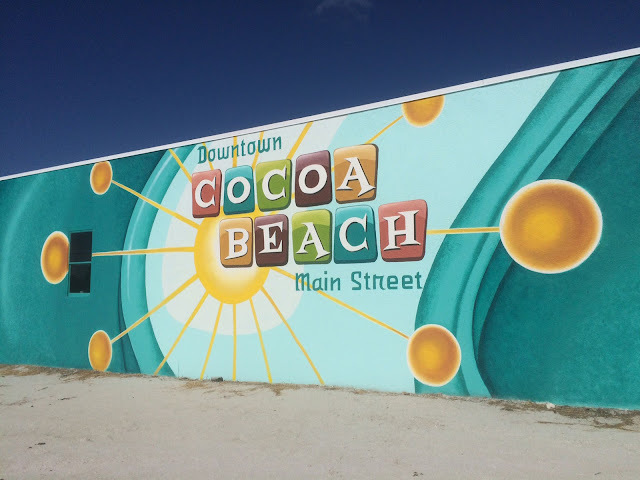 The administration of the City of Cocoa Beach is operating out of temporary quarters and probably will for a while. The heavy rains the last few days on top of our already saturated ground has the City Manager considering whether to shoot for at least one rice harvest at the golf course while conditions are so favorable. The river remains too high to accept any runoff so new precipitation sits where it lands. As expected, sales numbers were off in September as we lost a big chunk of the month to Irma. In September 2016, with no storms, 66 condos and townhomes were closed in Cocoa Beach and Cape Canaveral. This September, just 40. The rising trend of condo mortgages continued with 60% of all condo sales financed. High dollar condo sales were particularly slow with only two sales exceeding $375,000. Another persistent dynamic is low inventory and fast sales. Over a third of the closed condos sold in less than two weeks. That's to be expected with an inventory of 193 units and an average monthly sales rate of 60. The fast sales are only happening with the units that are listed at fair prices, not the overpriced listings that predominate the MLS. It's not unusual to see sellers take a long shot with an initial optimistic asking price and then reduce when the market doesn't respond. One problem with that is some become married to that crazy number and hang there in Neverland for months. Well over half of all current listings have been on the market for over three months. In a market where a third of listings sell in the first two weeks that is a sure sing of overpricing. The eleven closed units that were on the market over 90 days had dropped their initial asking price by an average of 7% before selling. Once reduced they sold for an average of 97% of the new asking price. All but one of the 14 units that sold in two weeks or less sold without a price drop. Seven units sold in the month at or above asking price and all 40 closed for an average of 96% of last asking price. This tells me that these sellers weren't willing to accept much below asking price regardless of whether the asking was fair or not. Consider that when deciding on an offering price. September was an excellent month for waves with a couple of truly epic clean, well-overhead days. We lost some sand to the constant battering but considering the amount and size of the constant swell the erosion was minimal. The beach fishing suffered with this year's mullet run unfishable from the beach during the rough days. I strapped my lifeguard stand to a coconut tree for the storm but sadly it wasn't worth saving once freed. My plastic yard flamingos survived their second hurricane, unmoved. Around midnight Sunday, I began to question my decision to ride out Irma in a little oceanfront condo in south Cocoa Beach, especially considering that my mother-in-law was a hunkering down in the next room on my recommendation. I'd had my wife evacuate her to Cocoa Beach from her home in the projected path on the west coast. A storm passing 100 miles away shouldn't be a threat. Right? But, with no Weather Channel updates since the power went out at 7:30, and the intensity of the noise outside, I couldn't be certain that the storm hadn't taken a hard turn and was hitting Cocoa Beach directly. 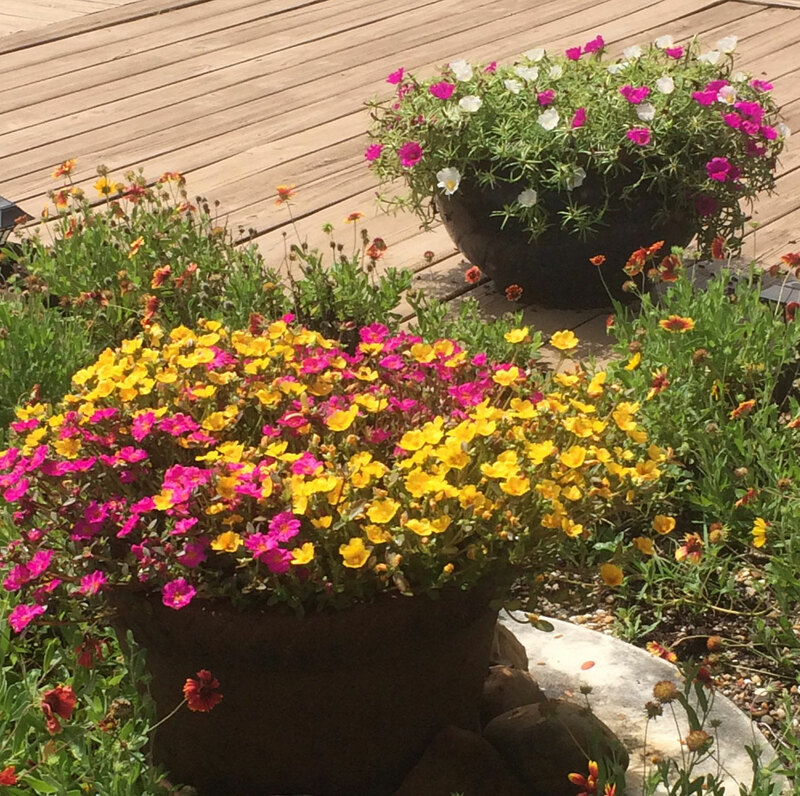 My doubts began when the first air conditioner blew off the roof and into the pool. I had an idea what it might be but with all shutters closed I couldn't be sure that it wasn't a Cessna. We all eventually managed to drift off to sleep in the absence of a shutter failure and woke early wondering what sunrise would reveal. Not bad. No catastrophic building failures were visible in our immediate area but most every building was showing some signs of damage with older buildings faring the worst. Elsewhere Cocoa Beach had a few buildings that are probably total losses like the Sea Aire Motel and the funeral home among others. The downtown area was especially hard hit with many commercial buildings losing their roofs including my office and the Police Department/City Hall. It's now six days later and many areas of Cocoa Beach are still without power including my neighbors right across A1A in south Cocoa Beach and most of downtown. Water supply to Cocoa Beach was lost during the storm but most properties had water restored by Wednesday. During the waterless days I, like many residents, used a debris filled pool for my daily bath and as a water supply for flushing toilets. Some traffic lights are working today and a few businesses have reopened. I just heard that downtown will likely not have power restored until after the weekend. Overall, we were fortunate to escape with the damage we had. I know those who suffered the greater damages or those still without power don't feel very lucky but it only takes a look at the Keys to confirm our fortune. I won't try to detail all impacts but thought those who aren't here would appreciate some report of the impact. We are battered, bruised but still standing and, some of us, looking forward to a cooked meal. I was reminded this week that experience alone is not a good measure of the quality of service one can expect to receive from a real estate agent. I closed a deal last week with a freshly licensed agent on what may have been her very first deal. I didn't ask not wanting to embarrass her. At any rate, recently out of real estate school, she handled everything from first showing to closing like a seasoned pro. She was responsive to every obstacle that presented itself and never fumbled once through the several week transaction. Her client was well-served and probably didn't realize how well they were being represented. This week I am trying to put together a deal with an older agent with several decades of experience under his belt. Like far too many experienced agents, he is embarrassingly out of date on his contract knowledge and has asked for several crazy changes to the contract that are dangerous for his client and that will likely sabotage the deal. He has taken two days to respond to every question or counter-offer and I'm currently on day three waiting for a response to our last counter. I doubt that his elderly client is aware of how he's mishandling the listing. She only knows that he's got enough experience to be good at what he does. Not. Those of us with years of experience run the risk of becoming too cute for our clients' good. Prime example is the very common demand for escrow deposits to be held at the title company. That's a no-no that any new agent knows the reason for. Not so with many experienced agents who should know better. Buyers and sellers, don't let your agent's preoccupation with the minutiae of the deal torpedo the deal itself. Question their recommendations if they don't sound right to you. The difference of a few days on a contractual time period may not be material and in most cases is not worth losing a deal over. I'm looking at you Mr. 15-day-VA-loan-approval guy. Likewise, demanding a delay of title commitment by a few days is of little benefit to a seller and actually damaging if it contributes to a buyer withdrawing. Eyes on the ball, guys. No score, no check. I took the picture above of a shoreline in Mosquito Lagoon this week on a fishing trip with Travis Tanner. My Bahamian buddy and I fish with Travis every year and this trip was like every previous year, plenty of fish and a great experience. We caught all the redfish we cared to pull on and had a great day on the water. I highly recommend Capt. Travis if someone wants the fishing trip of a lifetime in these pristine waters in the shadow of the launch pads. He can be found at mosquito-lagoon-fishing.com A trip would be a great present for a loved one. I sat down at the Abaco Inn last week for an afternoon hydration and a guy on a nearby stool nodded and said, "I used to surf Cocoa all the time." Huh? I guess he saw the confusion on my face and pointed at my Cocoa Beach Surf Company baseball cap. Cheers. If you surfed in Cocoa it was on a boat wake. I remembered the agent from Orlando coming to our office who called saying he had been all over Brevard Avenue but could not find our office. The Orlando TV stations and newspapers are notorious for making this same mistake. Remember the Oscar Meyer bologna kid? My city has a first name. It's C O C O A. My city has a last name. It's B E A C H. If, like either of these people, one omits my city's last name, the margin of error is about 10 miles and in the case of the bar patron, the Indian River rather than the Atlantic Ocean. The Orlando agent was scouring Brevard Avenue in Cocoa Village not Cocoa Beach, three bridges and 20 minutes drive time away. Small things can undo large things. It's not uncommon for a contract to specify issues to be completed prior to closing. Examples: "front door to be replaced", "all contents to be removed and unit cleaned", "broken window to be replaced", "hurricane shutters to be serviced and operational", "refrigerator to be installed". The buyer's final walk-through prior to closing confirms to their satisfaction that the agreed upon items have been completed. No fridge and closing doesn't happen until it's delivered or an agreeable price concession is made. If the buyer needs an item to be done in advance of final walkthrough, the timeline needs to be specified in the contract. I saw an otherwise solid contract fail a couple of weeks ago because the buyer demanded an appliance installed a month before closing rather than by closing. A simple missing clause on a contract torpedoed the deal. I called a listing agent yesterday to discuss her overpriced oceanfront condo listing. It's not unusual in these calls for a listing agent to tell me that she realizes the asking price is high but the seller insisted on the asking price and it might take some time for him to realize that the market isn't going to deliver his expectation. Other times, like yesterday, the listing agent can't or won't admit to the pricing error. In this case the unit is overpriced by at least $80,000 yet the listing agent, for some reason, is hanging her hat on a number that can't be supported by any comps. Go figure. Unsaleable listings still draw page views on Zillow so she may be able to steer inquiries to someone else's properly priced offering. In that context, any listing at any price is worth having. Nothing much has changed with our low inventory other than properly priced listings are selling and being replaced by more optimistically priced ones. Condo and townhome inventory is still below 200 existing units in Cocoa Beach and Cape Canaveral yet we still manage to close 12 to 15 every week. School started this week and there are drastically fewer vacationers in town. I think it's safe to say real estate activity will follow that lead and cruise from now through Christmas at a more relaxed pace. Snook season opens in a couple of weeks and the mullet run will follow shortly. Sharpen your hooks and patch the cast net if it needs it. Interviewer: What about "I ain't good lookin' but I'm someone's child…" [from "D'You Know What I Mean"]? Liam: Well, I don't know about that. You can tell he (Noel) wrote that one, can't ya? Even when I sing it I'm going, "Not too sure about that one…"
The routine summer flatness prompted me to offer a contrast of that lake of an ocean that summer visitors see. 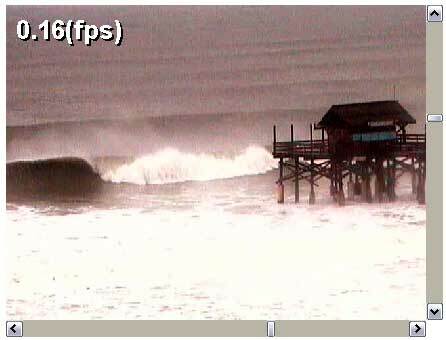 The webcam screen grab above was during an epic hurricane swell at the Cocoa Beach Pier years ago. Most visitors have never seen our surf in such form but it does happen and more often than most would think. Regretfully I have no shots of the Halloween swell of 1991 from the Perfect Storm off New England. All my shots of that one are biologically stored and unavailable for publication. Another year already half gone. 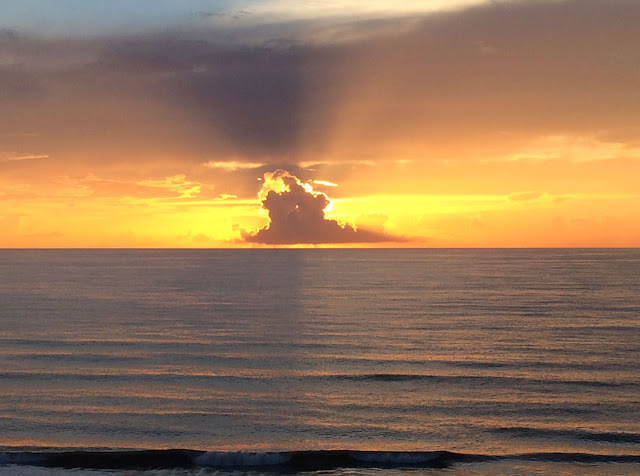 Despite the tight inventory of properties for sale in Cocoa Beach and Cape Canaveral, the first half of July has been strong. Forty two condos and townhouses have gone under contract in the first 14 days of the month, a quarter of those on the market less than two weeks. Activity was spread across all prices with the median at $225,000. During the same two weeks, eight single family homes were successful in getting a contract. As of this morning there are 69 single family homes on offer in the two cities at prices between $3 MM and $274,900 with a median of $530,000. Inventory of existing condos for sale has declined to another all-time low of 190 total units offered at prices between $1.45 MM and $79,751. At the current sales rate, that is a 64 day supply. While prices are responding to the tight supply by continuing upward, many of the current listings are overpriced. Whether buying or selling, knowledge of fair current value goes a long way towards securing a contract. Enjoy the vacation. I am. It might have been nothing more than a cruel tease but we got our first long, soaking rain of the season on Friday after months of little to no rainfall. Every green and blooming thing in town is radiating happiness and it seems to be affecting the humans as well. The month of May finished with a bang in the local real estate market. As of this morning, the MLS is showing 67 condos and townhomes closed in Cocoa Beach and Cape Canaveral during the month. As is normal in our market, over half sold for cash and ten sold in the first week on the market. Average days on the market are creeping up as sellers, emboldened by low inventory and rising prices, are listing with ever more optimistic initial asking prices. As always, the market ultimately decides the selling price, not the seller. The MLS is showing 204 total existing condos and townhomes for sale in Cocoa Beach and Cape Canaveral this morning and another 27 to-be-built units. Action in the higher end of the condo market was subdued with only ten of the sold units closing for more than $399,000. Over half closed for less than $220,000. Decent oceanfront units were closing for prices mainly in the $230 to $285/sf range with only one smaller unit commanding over $300 per square foot. For perspective, there are 33 units currently asking over $300 per square foot. Only a few of them deserve that price. Single family home sales continued at a strong pace with 16 closed in May, five of them over a half million. Only three of the homes sold for cash. A third of the homes sold in the first 30 days on the market. There are 73 homes currently for sale in the two cities. The song remains the same; know how to, or have a buyer's agent who does, accurately estimate fair value of properties for sale. If a listing is priced closed to fair value, it usually sells quickly. If a condo, know that over half the interested parties will likely be offering cash. Those who have been looking for a while will know that putting off an offer until travel arrangements have been made will likely contribute to being to the table too late. It's possible and usually advisable for out of town buyers to have their agent go ahead and offer on attractively priced properties sight unseen as long as they can negotiate a long enough inspection period to accommodate travel here for viewing. As we oldtime surfers used to say, "the lip does not linger". SpaceX launched a previously flown Dragon Spacecraft on a resupply mission to the ISS yesterday and successfully landed the first stage of the Falcon 9 rocket vertically at LZ1 at the Cape after stage separation. The tremendous sonic boom of the returning Falcon loosened caulking and fillings all over town. A fine example of Jurassic World Cocoa Beach wildlife. I've seen this guy chase snakes away. 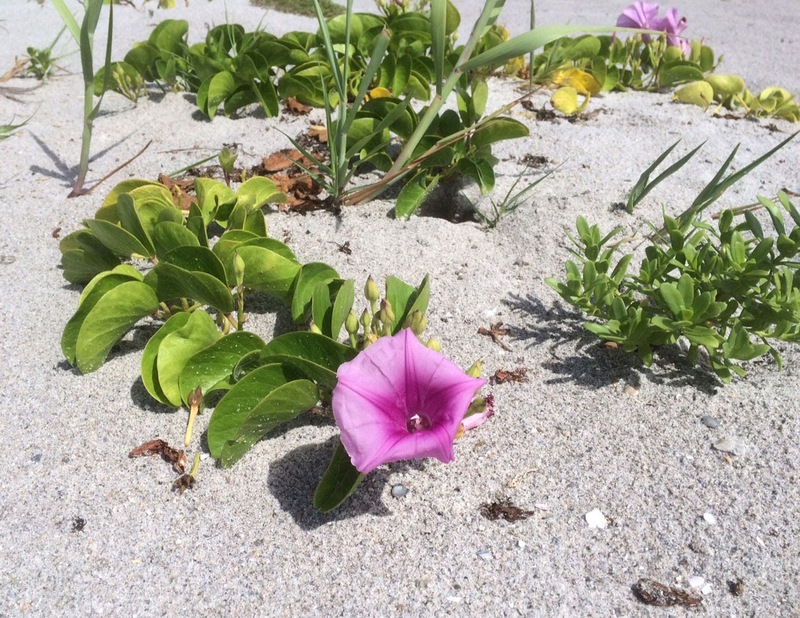 A few things: Several dozen property owners in Cocoa Beach and Cape Canaveral woke up Sunday morning of Memorial Day weekend to find (if they looked) that their property was being advertised on Zillow as "foreclosed" or "pre-foreclosure (auction)". Must have made for an interesting morning for those who caught it. Most probably didn't but you can bet that real estate agents across our area are frantically researching the flood of new distressed properties that their Zillow-using clients are calling about. The handful that I looked at when I got the alert proved to be mostly previously foreclosed properties that had long since been sold and off the MLS in some case for over six months. It was either a computer glitch during the night or a deliberate ploy by Zillow to increase traffic, their life-blood. We may never know. For the record, of the 298 residential listings in Cocoa Beach and Cape Canaveral this morning only five are distressed, four of them bank-owned, one auction and zero short sales. In the shenanigans category; another agent mentioned to me that a settlement statement he saw last week had a substantial "marketing fee" being paid by the seller to her broker. This was in addition to the commission already being paid which was at the top of the range I'm used to seeing. Not sure what extra "marketing" on this particular property deserved a bonus beyond what is usually provided in a listing but, hey, if they'll sign agreeing to pay more, why not? My opinion; disgraceful gouging, but I don't have all the details and perhaps the seller insisted to weekend ads in The Telegraph and Le Monde. to which the listing agent agreed with the extra fee. 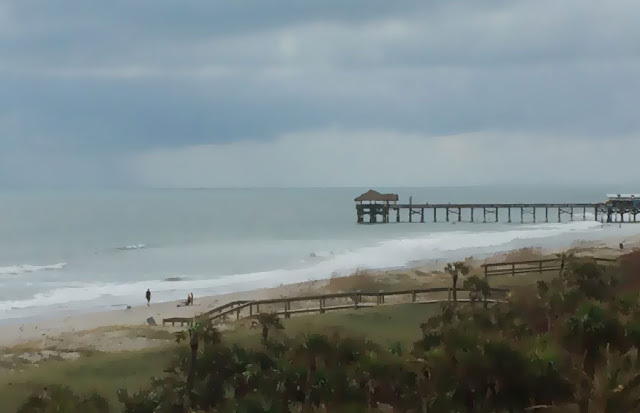 We are resting at a measly 200 total existing condos and townhomes actively for sale in Cocoa Beach and Cape Canaveral. There are another 27 pre-construction units offered to the market's collective indifference. The low inventory numbers may have finally put the brakes on the sales rate. In the last two weeks only 21 units have gone under contract, quite a slow-down from activity in the first quarter. Five of those sold within the first five days on the market. So far in the month of May, 53 units have closed, 32 of them bought with cash. Fifteen single family homes have closed so far in May with only three of those purchased with cash. Speculations: A frequent question I get is "Should I wait to look for a property to purchase in Cocoa Beach assuming prices will be better later?" Looking at our 200 unit inventory, which I though would level out many dozens of units higher, I don't see any forces that would contribute to prices retreating from current levels. This is, of course, barring a macro event like dollar collapse, war with North Korea or another country gaining control of our executive branch. Demand is still high and the appreciation we see appears to be at a healthy sustainable rate. Without a flood of new properties, the demand should continue to exceed the supply well into next year and beyond. The takeaway for those who agree is to continue the search if purchasing is the goal. Waiting for a dip in prices could prove expensive. There's an excellent new fish market downtown Cocoa Beach on the beach side of South Atlantic just south of Minutemen next to the sunglasses shop. 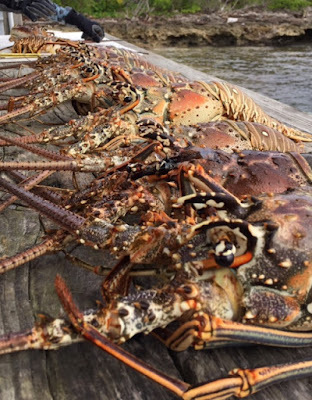 It's Coconut's Fresh Catch Market and it's not what you might expect. 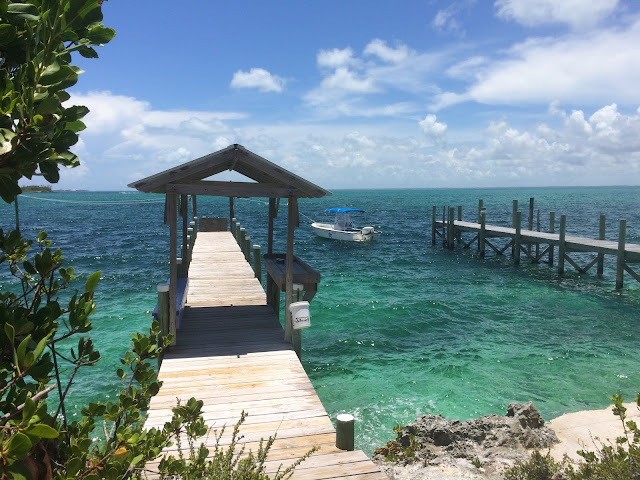 I've been in three times and I've found big, fresh cuts of locally-caught fish, tripletail, cobia, tuna and mahi in addition to some other not-local fish. Homemade crab cakes ready to cook for $5 each. The prices are slightly higher than the markets at the Port but the difference won't buy the gas there and back and the quality is equal. If you like fresh seafood, check them out and support this welcome addition to the community. On this Memorial Day we celebrate and honor those who made the greatest sacrifice defending our freedom and way of life. Think about the idea of someone you don't know dying to protect your right to the way of life you enjoy. That is what this holiday is about. In addition, there are thousands of living Americans serving right now knowing the possibility of their making the greatest sacrifice is part of their service. To those before you and to you, thank you and a tip o' the glass. I apologize for the long interval between posts. 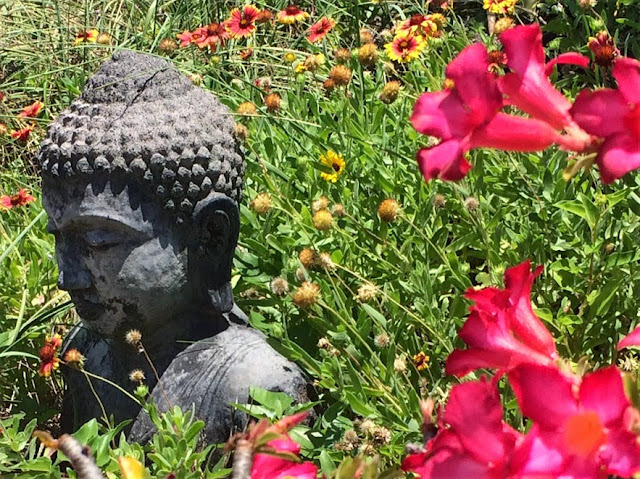 Over the last couple of weeks I began writing two different tales of shenanigans and outrageous behavior in the local real estate market, a favorite subject for writer and reader. Alas, a moment of level-headedness led me to shelve both articles. Rather than leave the reader hanging, briefly, one was about an episode of collective insanity at one of Cocoa Beach's largest (and tallest) condos. After years of willingly filling out prospective buyers' lenders' questionnaires, the association decided that they would no longer complete the required form. I happened to be the unfortunate agent with a buyer seeking a mortgage who was first confronted with the new policy. The association, after refusing to complete the form, referred the lender to the association's attorney who likewise refused citing imagined liability. What the association and their attorney failed to anticipate was the consequence of not completing the form. Without a completed form, the 108 owners in the building would not be able to sell to someone who needed a mortgage to purchase. It would effectively become a cash-only building. Here's what the form looks like for those interested. After a few owners were alerted to the consequence of the new policy a small uprising ignited, the questionnaire was swiftly completed by a Board member and the loan package proceeded to underwriting, disaster averted. The other tale of real estate drama I chose not to share was having my behind chewed viciously by a listing agent over some excluded contents in a "fully furnished" condo. She felt that I was being unreasonable in asking for an excluded items list prior to making our best and final offer. We ultimately offered without the list which was then produced, five days after listing, with, in our opinion, excessive exclusions. We ultimately reached agreement but not before I endured a scathing tirade and a hangup. All part of the job. About hangups: I got to thinking that punching the red "END" button on a cell phone, no matter how vigorously, is not nearly as gratifying as slamming a heavy phone receiver into its cradle. The millennials among us will never experience that warm fuzzy. 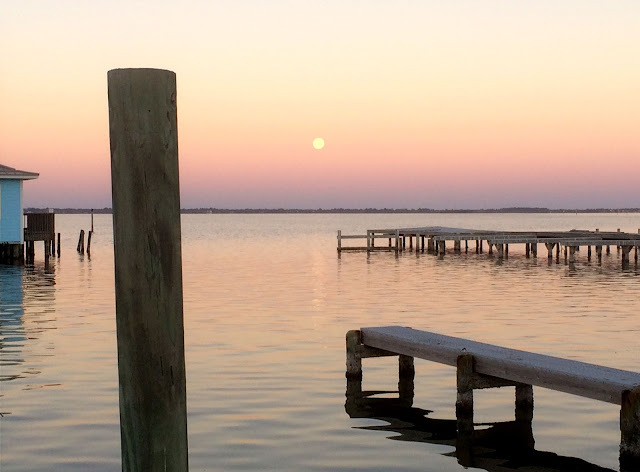 On to real estate activity in Cocoa Beach and Cape Canaveral. Since May 1, fourteen single family homes and 45 condos and townhomes in our two cities have received accepted contracts and another 70 new listings have come on the market. During the same time 46 properties have closed. Over half, 26, of the sold properties sold for cash, no mortgage. Inventory this morning sits at 206 existing condos and townhomes for sale in Cocoa Beach and Cape Canaveral. There are another 27 pre-construction units offered but they seem to be attracting very little attention despite compelling pricing at at least one of the projects. There are 72 single family homes for sale in the two cities, half of them waterfront and just under half asking over a half million. Super boat races in the ocean off Cocoa Beach this weekend. Best places to view other than from a helicopter or boat will be in the stretch from about the Pier to Xanadu. The boats will be available for up close viewing on their trailers Friday night downtown. Hope to see some of you there. Minutemen Causeway streetscape is nearing completion. Landscaping is being plugged in and it looks like the finished product will be beautiful. It's very welcomed. 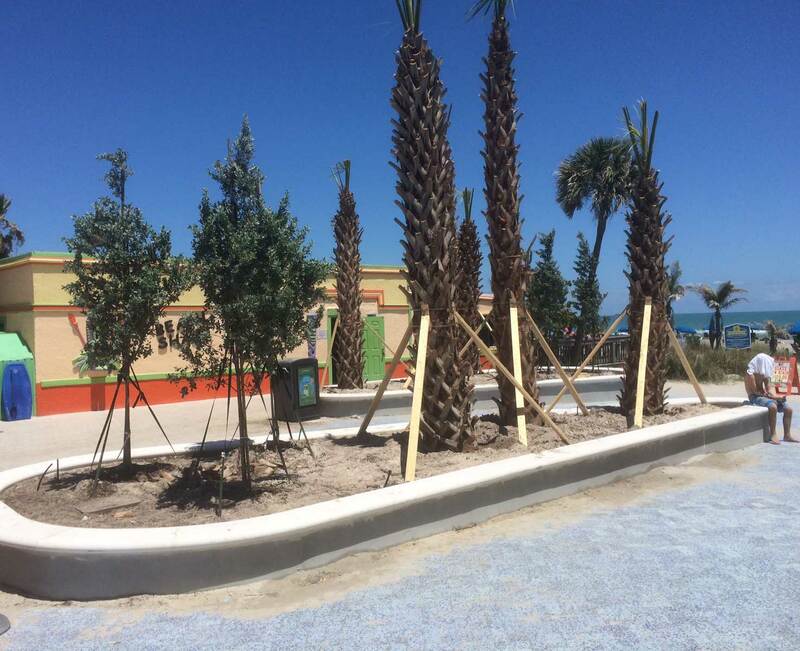 The oceanfront block is closed to vehicular traffic and is pedestrian only now, pavers and planters from Atlantic Ave. to the beach. Sales activity in Cocoa Beach and Cape Canaveral continues at a plodding pace thanks to the depleted and showing no signs of changing inventory. With a total condo and townhome inventory of 209 existing units in the two cities, finding a suitable property has become more of an epic quest than a narrowing down of suitable possibilities. Those looking for a single family home are even more constrained with a total of 72 possibilities, half of those asking a half million or more. In the two weeks since Sunday April 16, forty three people were successful in their condo search and were able to put units under contract. During the same two weeks nine single family homes were contracted. With a roster of hundreds of agents trying to get a slice of the beach pie and only a few dozen actually involved in transactions, you may soon find your last agent bagging groceries at Publix. Those with a gainfully employed spouse may have the luxury of retreating beyond the break on a locally shaped log. 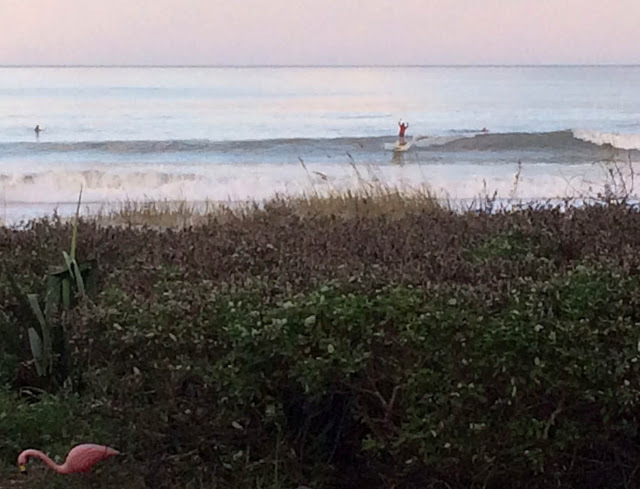 Tasty waves in Cocoa Beach are in much greater supply than attractively-priced real estate listings. A third of the condos were on the market less than a month and half of those less than a week. It's competitive for buyers and units that are priced right when listed are gone quickly. This has changed seller and listing agent behavior. Why not overprice and see what happens? The seller can always reduce the price later and the listing agents need inventory so anything, no matter the price, is good for them. Speaking of overpaying, buyers, when faced with an unreasonable seller of a property they like, have to ask themselves whether it makes sense to knowingly overpay by X% now or risk not finding another suitable property during the time prices move up by X+Y%. Buyers who made this difficult decision at any time in the last several years came out ahead. Buyers who think like I do that the demand and supply dynamic will continue to nudge prices higher should not run from a small overpayment. Conversely, buyers who think that prices will not continue the current trend should stick to their guns and not pay a dime more than what the comps suggest is current fair value. It's important to know how to figure out what that number is or have an agent who can. No matter who is doing the estimation remember that one comp does not determine fair value. Randolph may have sold his unit down the hall for $220,000 but that doesn't automatically make mine worth $220,000 when similar units in other buildings are selling for $250,000. Be smart and look at all angles. Creative thinking may be rewarded. Snowbird season ended with a bang Easter Sunday and we woke up Monday morning to a different, much less hectic town. I can once again drive from downtown Cocoa Beach to Port Canaveral for lunch and expect to make the trip there, eat an excellent fish sandwich dockside and drive back in little more than an hour if need be. In the week from Sunday April 9, 2017, through Sunday, April 16, a total of 18 condo units and seven single family homes received accepted contracts in Cocoa Beach and Cape Canaveral. The homes were in a range of asking prices between $289,900 for a non-waterfront 4/2 three blocks from the beach to $749,500 for a gorgeous two story 3000 square foot beauty on a canal. None of the condos contracted during the week were asking over a half million and half of them were under $200,000. Current condo inventory for sale stands at 210 exiting units in the two cities. That's about a three month supply at the current sales rate. Pickings are slim for the fairly large numbers of prospective buyers. Those of us in south Cocoa Beach have been entertained in the last week or two by frequent sightings of a wild bobcat that has been roaming the dunes. 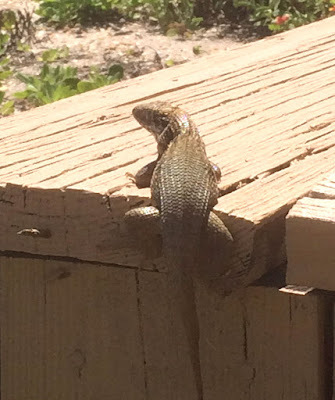 The swamp rabbit that's been eating my backyard flowers has apparently been successfully avoiding contact with this large predator as I continue to wake up every day to fewer flowers. Those of you with pets are probably well-advised to keep the little fluffies safely inside for a while. Crews have been making noticeable progress (finally) on the Minutemen streetscape project with the center block leveled and sidewalk work begun. Palm trees are going in on the ocean end of Minutemen and my first impression is positive. It's a great visual improvement. Don't forget Friday Fest this Friday night downtown. I hope to see y'all there. The crush of snowbird season 2017 is firmly behind us now. After Easter we will drift into a brief slow season before school is done for the year and summer vacations kick in. 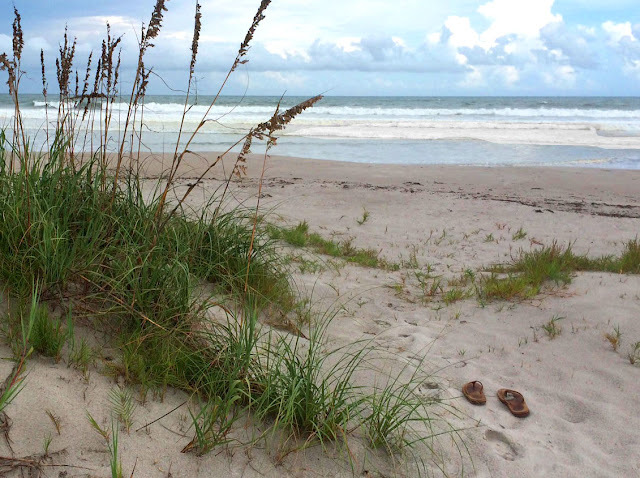 Anyone who has only seen Cocoa Beach during the busy snowbird or summer seasons might be surprised at the laid-back feel here in late April and May. It's a good time to be in Cocoa Beach. Property sales were slower in Cocoa Beach and Cape Canaveral this past week, Sunday April 2 through today. There were 15 condos and two single family homes contracted during the seven day period while we gained 13 new condo listings and 5 new single family homes. Our inventory of properties for sale is virtually unchanged from last week with 219 existing condos and townhomes and 68 single family homes currently offered. Only a third of the single families have been for sale for longer than three months. In contrast, over half of the condos have been for sale longer than three months, a sure sign of overpricing. Of the 174 condos closed so far in 2017, 54 sold in the first two weeks on the market with 35 of those gone in the first five days. Price it right and it's gone immediately. I would advise those of you looking to purchase to get your finances in order prior to starting the search. If you're going to be getting a mortgage, talk to lenders now, choose the one you want to work with and begin the process. You are guaranteed to become frustrated along the way with the many requests for documents so getting in front of that will make your life less stressful. Same for cash buyers. Know how long it will take for your funds to become liquid and have a proof of funds document ready to provide with your offer. The large majority of purchase contracts that I see for beach properties are written using the FAR-BAR "As-Is" contract. "As-Is" in theory means that the contract is for the property in the condition it's now in, "as-is". In practice, "As-Is" means the buyer is willing to purchase the property for this price IF no deal-killing conditions are found during inspection. It's not uncommon for the buyer to go back to the seller after inspections have been done and ask for either repairs or a price concession for issues found during inspection. That is fair for hidden issues. Here on the beach the number one hidden issue is a rooftop AC compressor with one rusted foot in the grave. That is a reasonable issue for price renegotiation if it wasn't disclosed already. Going back after inspections and asking for concessions for issues that were either disclosed or are plainly visible is not going to be well received. The "As-Is" contract gives the buyer "sole discretion" to cancel the contract and receive refund of deposit if done within the inspection period. That puts total control of the contract (read: negotiating strength) in the buyer's hands. If the seller refuses to renegotiate the buyer can either stick with the original contract and move forward or cancel. It's worth keeping in mind that in the current market, a seller stands a good chance of finding another buyer while a buyer may have a much harder time finding another suitable similar property. It's Master's Sunday and we have four players within two stokes of the leaders, Justin Rose and Sergio Garcia. It's gonna be a good one. John John Florence won the Margaret River Pro in West Oz yesterday at Main Break in sizable and challenging surf. John has all the raw talent that we saw from Kelly at the same age. The Cocoa Beach business golf league kicks back off this Tuesday at noon. Anyone who'd like to get together for a weekly nine holes is welcome. It's fun, rates are super low and there is a chance to win a few bucks on a skin. Come on out. It's a friendly bunch of guys and girls. Tee off anytime between noon and dark. I skipped last week's summary so it's two for the price of one today. In summary, nothing much has changed with property sales almost exactly equaling new listings, a net zero effect on our meager inventory. For the seven days ending last Sunday, 23 condos and townhomes and 5 single family homes went under contract, six of them within a week of listing. During the same period there were 22 new listings. In this most recent week, March 19 through March 26, there were another 24 new listings with 19 new accepted contracts, four of them in the first week on the market. There are 220 existing condo units and 66 single family homes for sale in Cocoa Beach and Cape Canaveral this morning. That is only slightly more than the number of properties that have gone under contract so far this year. An unusual number of the condo transaction I've been involved in recently have been in first right of refusal complexes. There is a lot of misunderstanding about how this antiquated process works and how it should be carried out. From experience, I can say that it is often being done contrary to the procedure the condo docs proscribe. Procedures outlined in the condo docs vary among the dozens of local condo associations that have this right and the Board's or management company's interpretation of the docs is often wrong. First right of refusal gives the association and/or the members (owners) of the association the right to take over a contract to purchase from an outside buyer. For instance, if I contract to purchase a unit in a first right building, the association will offer my contract to the existing owners and they will each have the right to take my contract away from me and purchase the unit at the same terms. Some complexes mail a copy of the contract to all owners and some post it on a bulletin board or website. The length of time is usually between 10 and 21 days in our area. Most docs spell out that a sale to an existing owner is not subject to first right. There is a popular weekly rental complex in Cocoa Beach whose docs spell this exclusion out but the longtime management company insists on offering every contract out to the members regardless of whether the purchaser is already an owner in the complex. There are other complexes offering the right to members where that right only applies to the association and not individual members. I used to own in a complex with first right or so the owners thought. When challenged by a new purchaser, it was discovered that the first right did not and never had existed despite having been offered for over ten years. I would encourage everyone who owns in a first right building and especially Board members to read the condo docs carefully. There is a good chance that the procedure being used for the last two decades is wrong. It may be of little concern to an owner who is not involved in a dispute, but a lawsuit over the interpretation may prevent that innocent owner from being able to sell her unit. And on another well-worn topic, I continue to receive requests to hold escrow deposits at title companies from agents who should know better. If there is an agent or broker out there who has a good reason for wanting a deposit held at a title company rather than a real estate broker's escrow account, I'd love to hear it. I'll give you a hint; there are none. In the event of a rare dispute over a deposit, I'll take a State of Florida free dispute resolution any day over dueling lawyers. 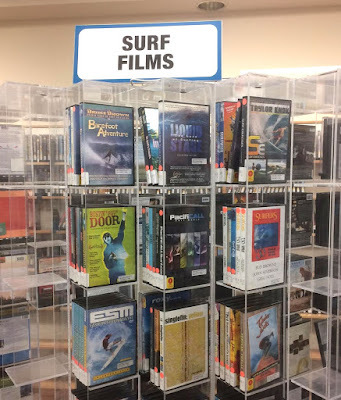 You know you're in a beach town when the front rack of DVDs at the public library is all surf flicks. Cocoa Beach Library DVD room pictured. 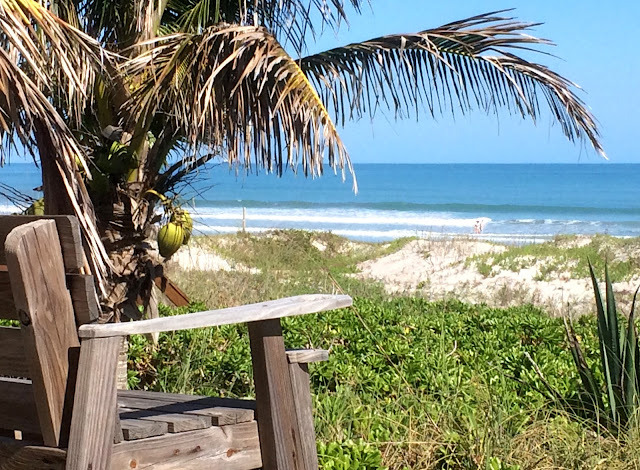 Will the Cocoa Beach and Cape Canaveral real estate market ever return to a healthy supply of properties for sale? I hope for more inventory but I'm not optimistic. Our historical supply peak was in 2006 when we had just under 1200 condo and townhouse units for sale. The long decline began the following year with short sales and foreclosures dominating activity and continued dropping through 2015 when we bottomed at less than 200 units for sale with the distressed inventory depleted. We are only slightly above that number at present with 222 existing units for sale. At the sales rate we averaged last year, we have enough inventory to make it to mid-July. There were 24 new condo listings in the week from Sunday March 5 through March 12. Seventeen units were contracted during the same seven days. There does not seem to be anything suggesting an increase in the supply in the foreseeable future. Barring external events this should continue to urge prices higher. 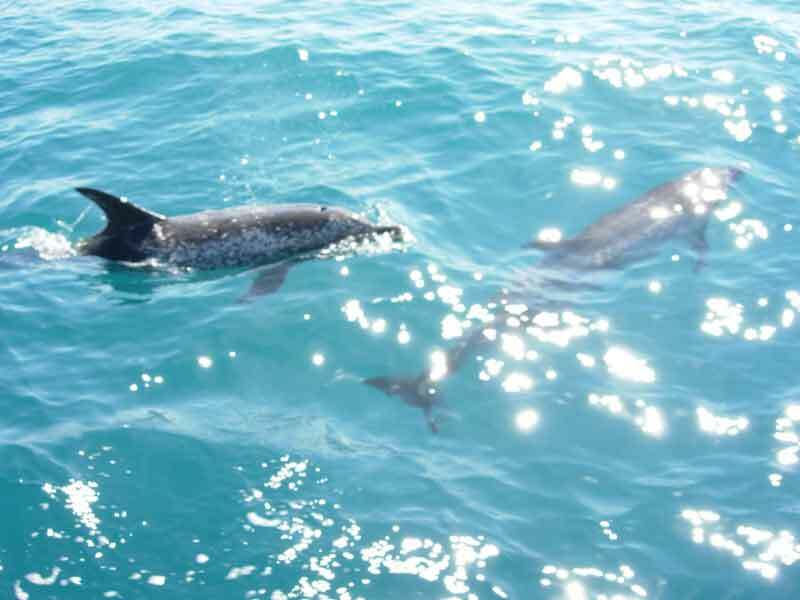 There are 46 direct ocean units with a view currently available, over half asking above $500,000. Lookers are out in droves but are having an increasingly difficult time finding fairly priced listings. Sellers are listing properties above fair value and hoping for a home run. Over 60% of the total listings have been on the market over 60 days, a clear sign of overpricing in a year when two out of five sold properties were on the market less than a month. I think it's safe to expect prices to continue to rise in the near future. Slightly higher mortgage rates seem unlikely to impact sales with 60% of all condo sales so far this year having been paid for with cash. Things are only slightly different with single-family homes, 40% of those purchases this year paid for with cash. Good hunting if you're looking. Know that you're not alone and need to be ready to move quickly if you hope to succeed in your search. Real estate activity in Cocoa Beach and Cape Canaveral continued at the same steady pace last week with 28 residential properties going under contract in the week from Sunday, February 26, to March 5. Six of those were on the market for a week or less. The inventory was barely changed with 27 new listings hitting the MLS during that same seven-day period. There are currently 66 single family homes for sale in our two cities, exactly half of which have been on the market for less than two months. There are 244 condos and townhomes for sale, 27 of which do not exist yet giving a prospective buyer a universe of 217 existing units from which to choose. If an oceanfront building is a must-have, that number shrinks to 89 units with a median asking price of $375,000. A buyer looking for a direct oceanfront unit with at least two bedrooms and two baths asking less than $300,000 has two possibilities, both ground floor. Closed sales for the month of February 2017 were considerably stronger than the same month a year earlier with 42 condos and townhomes closed, 40% of which were on the market less than a month and half of which were purchased with cash. Sixteen single family homes closed in February with a median time on market of 80 days. A third were purchased with cash. The routine has not changed for those hoping to purchase. Have your financing and/or cash in order and be ready to move quickly when an attractive target presents itself. The best properties are going to those who act quickly. Our ongoing inventory shortage is showing no signs of abating. After two days of temps in the 50s our winter that wasn't resumed with daily temps in the mid 70s to high 80s. The pleasant weather has made for crowded and slow conditions on the always packed (this time of year) Cocoa Beach golf course. For maximum enjoyment, golfers are advised to bring plenty of patience. The foursome in front will almost certainly be scavenging balls from every water hazard along the way slowing the pace even more. After Easter, it's "back to good" to quote Matchbox 20. First off, I would like to thank all those who have offered comments, suggestions, and encouragement over the years. All feedback is appreciated. 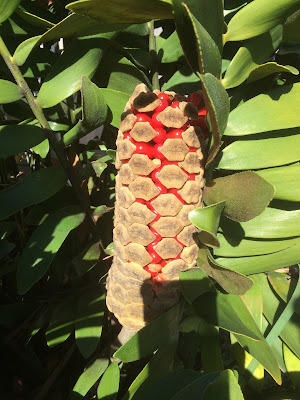 When I began writing this blog twelve years ago I made a decision to restrict my research and commentary to the Cocoa Beach and Cape Canaveral markets and to leave the rest of the county to others. This was probably originally rooted in laziness (less to research) but that narrow focus has allowed me to develop a deep understanding of this little market in the intervening twelve years. Other than macro themes affecting all markets, what was happening in Palm Bay or Merritt Island had little correlation to our beach markets. That hasn't changed. A buyer would be ill-advised to ask my opinion about or to engage my representation in the Titusville market. I would apply all of my experience to get the best possible deal with the least risk for my client but I wouldn't know what I may have overlooked in my research. There might be something market-specific and relevant to the property that only an involved local agent would know. To paraphrase a wise general, "we know there are things we don't know but there are also things we don't know we don't know. It is the latter category that tends to be the difficult one." If buying or selling beachside, I advise using an agent who is active in and knows this specific market. The consequence of an agent's ignorance can be costly for their client. Using an out-of-town agent is a risk that makes zero sense. 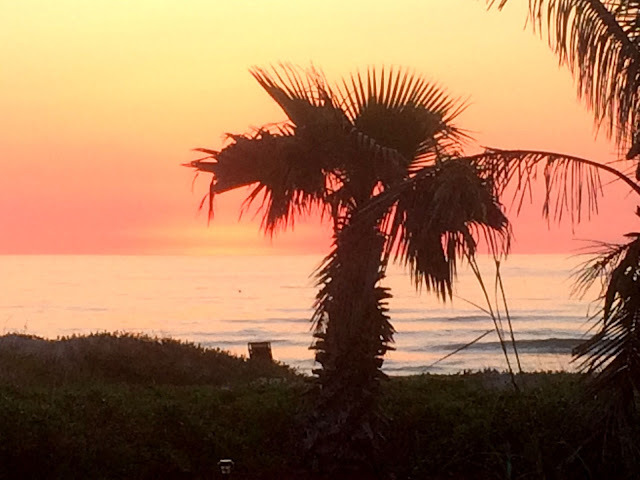 There were 25 new listings of residential property in Cocoa Beach and Cape Canaveral this past week. Four of them were under contract in four days or less. An additional 16 properties went under contract during the week. The tight inventory continues to be frustrating for those hoping to purchase. Someone looking for an east facing direct ocean condo above the ground floor for less than $350,000 has four possibilities this morning. If they must have a garage there is only one that will fit the bill. Raise that budget to $500,000 and there are several excellent units to consider. There is a new listing this morning in south Cocoa Beach, 4th floor, 3/2, tastefully and beautifully remodeled asking $499,000. Anyone looking in that price range would be advised to call their agent immediately. I doubt it will last for many days. What a week it's been. For that matter, what a "winter" it's been. Thursday and Saturday were the two best days of surf so far in 2017. The water is warm enough that the wetsuits have been retired for another year. There has been a school of giant black drum roaming the beach between Port Canaveral and Sebastian Inlet for several weeks. They were off Cocoa Beach earlier this past week and several people caught the fish of a lifetime. I enjoyed seeing several of you on the riverboat last night. A good time was had by all. There were no big changes in real estate activity in Cocoa Beach and Cape Canaveral the week of Sunday, February 12 to Sunday, February 19. The main themes of previous weeks remain firmly in place; low inventory and demand exceeding supply. Two-thirds of the 63 condo closings so far this year have been cash deals. Those hoping to purchase a condo who are planning to get a mortgage need to remember that when drafting their offers. Single family home buyers are more likely to use a mortgage with only a third of the 19 closed sales so far going for cash. Note to prospective buyers: one fifth of all closed sales so far this year sold in the first week on the market. If a property is desirable there will be multiple suitors immediately and the buyer who can't act quickly will lose out most times. I can say from repeated first-hand experience that those using an active local (Cocoa Beach) buyer's agent have a distinct edge. Three of my last four closings were under contract the first day on the market. We had 25 new MLS listings of residential properties during the week. One was under contract within five days and one of the new listings was an old stale listing refreshed with a new MLS number. During the same week, another 28 previously listed properties went under contract, six of those single family homes. Condo inventory is down to 216 existing units for sale in our two cities. That's less than the number of units that sold in a three-month period last spring. The same 27 pre-construction units are still offered with no takers since last week. Rounding out the shopping basket, there are 58 single family homes offered for sale, 28 of them waterfront. The non-winter of 2017 continues to amaze with high 70s and low 80s most days. 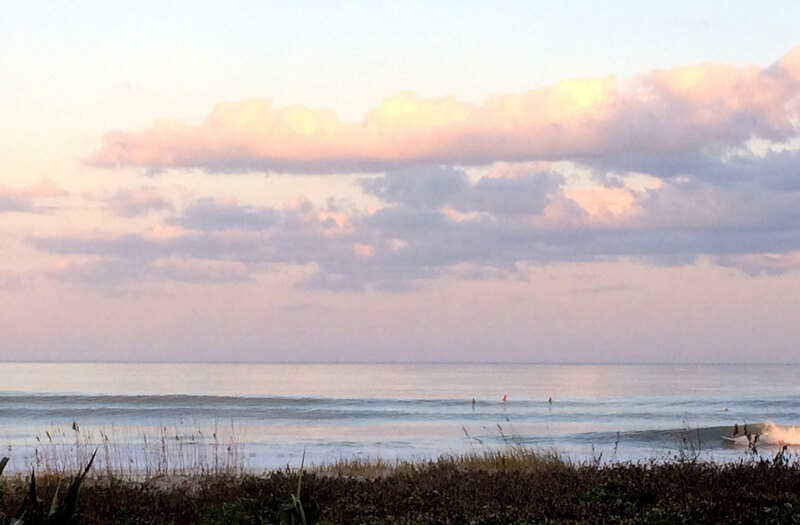 A wetsuit has not been needed this month for the several days of small, fun surf with surf temps hovering in the 70s. New listings in the week of Sunday, February 5 to Sunday, February 12 came on at the lowest weekly rate so far in 2017. We had just 21 new MLS listings of residential properties in Cocoa Beach and Cape Canaveral. Two were under contract within three days and three of the new listings were refreshed older listings. Fifteen of this week's new listings were condos or townhomes and six were single-family homes. During the same week another 19 properties that had been listed prior to last Sunday went under contract making a net inventory gain of zero for the week. Twelve properties were reported closed during the week, ten condos and two single families. Condo inventory stands at 220 existing units in our two cities with another 27 pre-construction units (same as last week) in yet-to-be-built buildings. There are 61 single family homes offered for sale, 28 of them waterfront, highest asking price $2.995 MM for a brand new beauty on the ocean at 1st St. South. Lowest priced waterfront currently offered is a fixer-upper on a canal in south Cocoa Beach just off the open river for $379,000. Exactly a third of all residential properties on the market have been for sale for over five months. We know what that means. The ocean end of the Minutemen streetscape project is taking shape and the finished product looks like it's going to be beautiful. [First photo above] There are two colors of pavers in the pedestrian only street laid in a pleasing pattern with a few scattered planters. Looks promising. The second photo shows the block between Atlantic and Orlando avenues. It still looks like a Todd Hoffman mining project but I'm very hopeful now that we've had a peek at the ocean end. Foot traffic last night downtown didn't seem to be deterred by the construction. Lots of people out enjoying the balmy weather and excellent live music at multiple venues. The Uber guys were busy.